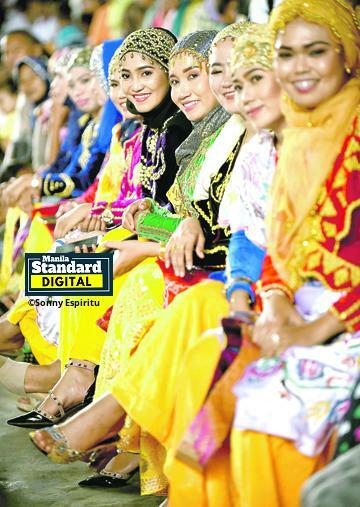 Ladies of Tawi-Tawi in the far south wear their dernier cri—Batawi and Sablay—for formal occasions, like the contract signing recently in Panglima Sugala town gymnasium and groundbreaking ceremony at the Tawi-Tawi Special Economic Zone and international transshipment port project. The avant-garde fashion is made of velvet or silk, designed intricately to fit perfectly into the person wearing it, with the outfit adorned with gold buttons. The occasion was attended by officials like William Ong, director of Sulu Sultanate Corp., Senator Aquilino Pimentel III, Peter Pun, Tawi-Tawi Gov. Hadji Sadikul Sahali, senatorial candidate Francis Tolentino and Datu Mohammad Kiram.